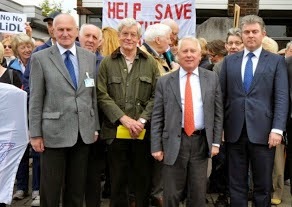 Even though Bob Neill ex pubs minister and Brandon Lewis, most recent pubs minister, couldn't give a flying TOSS about pubs until one closes down on their back door step and they sniff a chance of a few votes from locals they did turn up for a photo opp together for the Porcupine. And manage to get all of it completely wrong. Pubs will never stop being under threat with people like these guys in charge of them. The true Villain of the Piece here is not Lidl but the pub company who sold it to them for development. As is the case with thousands of instances of pubs being systemically asset stripped by their 'tied business model pubco' freeholders then, having been run into the ground, flogged off 'suitable for alternative use' to any buyer they can find. Tesco have turned 200 pubs into Local shops in recent years and have been given a seriously hard time for doing it. The fact is Tesco are not responsible for ruining the pubs they buy - the pubco's who took all the profits from the pubs and ran them into the ground then flogged them off are fairly and squarely the guilty parties but they always get off Scot free in such situations. It's a cultural crime these zombie pub companies are committing.